Microscope Gallery is extremely pleased to present a comprehensive selection of landmark films by avant-garde artist Barry Gerson, coinciding with a solo show at Thomas Erben Gallery. Curated by Mónica Savirón: “This silent program is an open window to the unique approach to filmmaking that Barry Gerson has explored and continues to master. It includes two digital films that have never been shown before, and five 16mm prints that were last projected more than ten years ago. For Gerson, the world is just an appearance; instead, dreams disclose reality, a hidden world that is gradually and magically revealed through movement, visual obstacles, and filtered light. Reminiscent of Japanese filmmaker Yasujirô Ozu’s poetic methods, Gerson restricts vision to allow in depth visibility, and to transcend limitations. There is an innocence and pureness in his work that triggers active discovery in the unexpected. Each film is presented without title cards or credits—they start and finish with the impetus of a spiritual burst, like water bubbles shining in their perfect, delicate tension. The spectator is invited to a play of emotions, by slowing down tempo and submerging consciousness. The central film, Episodes from the secret life, was part of the Whitney Biennial Exhibition in 1983. This is the last film Gerson made before putting down his camera for 20 years. To introduce the screening, two pieces by Bach will be played: Concerto for Four Harpsichords in A minor, and his Concerto for Three Harpsichords in C major. These pieces were included in Gerson’s debut, The Neon Rose, his only quasi-narrative feature. They are the soundtrack for a dream sequence that weaves together the various dimensions of Gerson’s vision: past, present, and future”. “His only film to incorporate found footage, it was made during the time Barry Gerson worked at the Sherman Grinberg Film Library on 9th Avenue, in New York. He combined images shot from the pilot cabin of an airplane with ABC Network News footage of a swimming competition. Instead of showing the swimmers, Gerson used only the end of the roll, the lapping of the water once the action was finished, accidental images shot by allowing the film to run out. Sky and water are, for Gerson, a natural fit.” — Mónica Savirón. “Grids on a window try to decipher the winter landscape. A cubistic rearrangement of the exterior world shapes floating sculptural forms with a magnetic force. Foreground and background are brought to the same plane of perception. An entire new vision unfolds behind the filmmaker’s house’s back porch.” —Mónica Savirón. - Shadow Space (16mm. Color. Silent. 16fps. 1973. 6 minutes. “Plant and window frame shadows are animated through the use of single framing in conjunction with precisely planned camera movements—giving the illusion of movement. Objects turn around—shadows move—sunlight mixes with polished wood grain. A confined space alive and teeming with energy—shapes merge forming new shapes. Red curtains blow violently—stark light reflections appear and disappear.” —Barry Gerson. “Poetic structure created through masking out of two separate images juxtaposing opposite motions, resulting in two visions of the world being viewed simultaneously. Our ideas about space and time, and about what and how we perceive are challenged. The content—white papers blowing to the floor, magnifying glass held by unseen hand studying objects on a moving table, woman waving goodbye from the railing of a bridge, etc.—is placed against a moving, three dimensionally charged field. Other scenes show a seedy looking man struggling with a large suitcase, carrying it up a fire escape while being surrounded by floating moving camera scenes from an impossible perspective—ground level looking up. Two brick walls are in a state of constant collision while a lightly trafficked bridge is superimposed.” —Barry Gerson. “Barry Gerson shoots two unfinished sculptures made of painted wood, adding external objects to create a theatrical tableau. 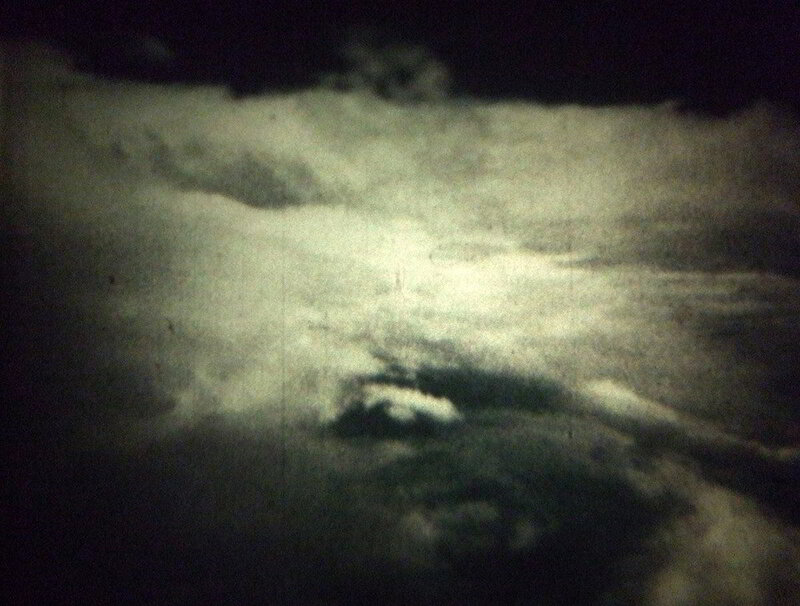 All elements are human-made, which is unusual in Gerson’s film work. The intersections between shapes and colors are not limitations, but cathartic connections that expand a spiritual and physical perception of the world. The reasons why they attract each other are a latent mystery.” —Mónica Savirón. “…A study of constantly changing tonal values that slowly erodes the fixed look of an image which consists of a vertical rectangle of sky and water… Near all the images have vertical, horizontal or angular barriers cutting the screen shape into sections and framing the illustrative space beyond… As in abstract painting, space depth is created more by color than by any relationship to physical perspective. The accumulation of mood is apprehensive, as if every small change in the secure balance of form within the fixed screen could be a possible threat to the totality.”—Bob Cowan, Take One Magazine. “Evocations of a space in the mind—limitless, soundless. Blackness punctuated by bursting water bubbles ascending and descending into the unknown. The color red evokes feelings of the inner self—a microcosmic viewpoint for an expansion of time and space.”—Barry Gerson. Total running time: 1 hour, 40 minutes. Program followed by conversation with the artist. Barry Gerson (Philadelphia, PA) is an artist-filmmaker who has made films, sculptures, photographic constructions, digital film installations, and mixed painting/photo works. He has had solo shows at the Whitney Museum of American Art, Guggenheim Museum, and the Museum of Modern Art in New York. His films have also been included in historic group shows such as The Montreaux Film Exhibition, Une Histoire Du Cinema, and The American Century Show at the Whitney Museum, Brooklyn Academy of Music, Toronto Film Festival, Museum d'Art Contemporani de Barcelona, Berlin Film Festival, and the New York Film Festival, Views From The Avant-Garde. His work is in the collections of the Museum of Modern Art in New York; Museum of Modern Art in Stockholm, Sweden; and the Centre National D'Art Et De Culture Georges-Pompidou in Paris. Mónica Savirón (Madrid, Spain) is a film writer, experimental filmmaker, and independent curator based in New York.